Dr Harirchian is a specialist in the face and she can perform many different types of facelifts and necklifts. During the consultation, she will examine your face and neck carefully and discuss your goals and recovery time. Dr Harirchian spends a lot of time with patients to understand their needs and to educate them on what would make them look their best. She combines her artistic eye, perfectionist style, and understanding of the science behind the aging process with cutting edge and advanced face and neck techniques. By focusing only on the face, Dr. Harirchian believes that she can give her patients the best care and outcomes. She can perform different types of facelifts, and will tailor her technique to best treat your face and neck. What happens to the face with age? With age, the muscle, connective tissue, and fat pads of the face and neck descend. The muscles of the neck can lose tone and descend, creating a sagging neck. The skin and subcutaneous fat may become thinner. Loss of elastin and collagen in the skin can reduce the skin’s strength. Subsequently, skin and muscle can descend with gravity. In the face, this can lead to the formation of “jowls,” deep nasolabial folds (“laugh lines”), deep marionette lines, and a poorly defined jawline. In the neck, this can lead to a poorly defined neckline, fullness underneath the chin, and neck “banding.” Face lift surgery can rejuvenate the face and neck by repositioning the descended tissue, eliminating jowls and creating a smooth straight neckline. Not all facelifts are the same. Dr Harirchian performs a modified deep plane face lift to create long lasting, natural, and youthful facelift results. This means that she dissects underneath the “deep plane” of the face and neck, to release ligaments and move muscle and fat layers back to a more natural and youthful position. After the deep structures are tightened and lifted, the excess skin is removed. The goal of Dr Harirchian’s facelift approach is to restore the youthful anatomy of the face and neck by lifting and repositioning the deeper tissues of the face. The focus is not on pulling or lifting skin only. Consequently, patients look natural and never look pulled or “windswept.” Studies have demonstrated that there is a greater longevity to facelift results when the deeper structures are repositioned rather than when the skin is lifted alone. 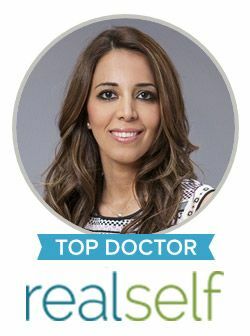 Dr. Harirchian can perform different types of face and necklifts, and she will tailor her technique to best treat your face. A full facelift addresses both the face and neck, and includes a necklift. It improves aging and sagging in the cheeks, midface, jowls, and neck. An incision is typically made underneath the chin, whereby excess neck fat is carefully and conservatively removed. A corset platysmaplasty is then performed to tighten the platysma neck muscle. An incision is then made in the hairline, behind the tragus, and behind the ear. This facelift incision is placed in natural skin creases to camouflage and hide signs of surgery. Dr Harirchian then performs a modified deep plane facelift, dissecting under the SMAS and platysma to lift and reposition the neck muscles, jowls, and midface. Consequently, the deep structures of the face and neck are repositioned back to a more youthful position. The goal is to restore your youthful anatomy and features, thereby ensuring natural results. A facelift can be combined with other procedures, including chin augmentation, fat grafting, eyelid surgery (blepharoplasty), and fractional Co2 laser resurfacing. Contact our office today to schedule your consultation with Dr. Harirchian about our facelift procedures. Procedure details: This patient was bothered by her neck and jowl region. Dr. Harirchian performed a modified deep plane facelift with improvement in her jowls, neck, and midface.